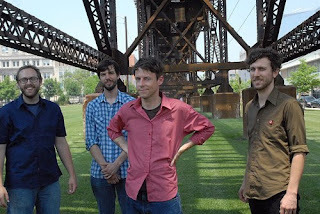 I could be compelled to speak about the consistency of Toronto-based Tony Dekker's Great Lake Swimmers following the release of group's fourth album, Lost Channel. Something interesting happened here though when the album was marketed to and found some success with the adult alternative format. In a way, I wish I wasn't on the Nettwerk PR list so I'd be ignorant to the fact one of my favorite musicians of the past five years has become more NPR-friendly than indie-cool. Of course while talk radio puts me to sleep, some say that Dekker's calculated pacing is numbered sheep in a musical format. I continue to love the reflective snail's pace though. Lost Channels was recorded in castles, churches, and community centers in and around the Saint Lawrence River's Thousand Islands. It's certainly a unique, or at least under-looked, pastoral kindred to a folk pop genre that seems to have a shamanistic connection to its settings. The obscurity of Great Lake Swimmers has baffled me following the success of Bon Iver. Both artists conjure up a rustic sound accompanied by excellent songwriting. This album was certainly more optimistic than previous offerings, but I was able something adequately moody in "Stealing Tomorrow," which landed on many more mix tapes made by me in 2009 than "Blood Bank."